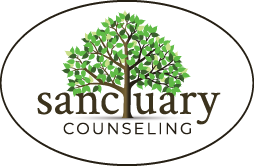 Month: July 2016 | Sanctuary Counseling, LLC. In my last post on Let’s Talk About Dreams! 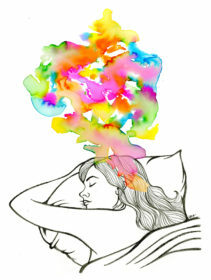 Part One, we talked about the relationship between dreams and REM sleep. This time I’d like to introduce you to another type of sleep. Yes, there are multiple types – in fact, it’s better to take a look at the following picture to explain how there can be more than one kind of sleeping since it can get technical. 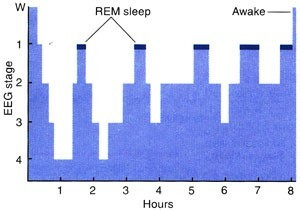 As you can see, REM sleep is the state closest to waking. We have to talk about the deep sleeps too; at stages 3 and 4. These are called slow wave sleep (aka… The deepest kind of sleep that you fall to before coming back up and experiencing REM again). This is a period where your brain is repairing itself from the kind of mental activity you spent during the day. It’s also the time when sleepwalking, bedwetting, and night terrors happen in children (which all include a kind of bodily-control element to them). Both REM Sleep and slow wave sleep serve a very important function: memory consolidation. REM sleep and non-REM sleep have different roles in making sure that the content of your day makes it from short-term memory to long-term memory. Without restful sleep, our memory suffers! In order to be able to talk about just how that happens, we need to talk about two different types of memory in addition to our two types of sleep. One type of memory is declarative memory (sometimes referred to as explicit memory or episodic memory). These are the memories that you can talk about casually, like that time you first took a driving test and left your mixtape on and the instructor complimented you on your ability to parallel park and create play lists and you felt like you just raised the bar for driver tests. Or that time in middle school where you totally caught your best friend chewing on a gum eraser from the art room and they lied and told you it was gum and when you asked for a piece of gum they got really defensive and you are sure it was a bold faced lie. The other type of memory is called non declarative memory (sometimes referred to as implicit memory). These are the memories you rely on academically, such as memorizing a list, remembering how to do math, or remembering things in order, like the alphabet… or your home phone number… or how to tie your shoe. This is the type of memory that matters when you are trying to learn something new and retain it. REM sleep seems to play a bigger role with consolidating the rote memorization, and slow-wave sleep where you don’t dream seems to consolidate memories of what happened during the day, episodically. There’s more to be said about learning and dreaming, but it deserves its own blog. Stay tuned! Truth – Art can be used to manage anxiety. The act of art can shift our focus to something more productive and healthy. It actually regulates our nervous system, helps us express ourselves without words and even helps one to connect with their inner self. Truth – Art can help to reduce stress. WHAT?! Yup, you heard it here. Art’s role in anxiety reduction also applies to reduce stress. Which makes sense since they can often go hand in hand. Art provides a distraction from our stressors, getting into a flow of creation instead of mental destruction, practicing self-care by having a healthy hobby, processing our past, dreaming about our future, and even teaching ourselves how to appreciate beauty. Lie – Art therapy is done only through drawing, painting and writing. This is just not true. Art therapy is done through creating! This includes drawing, painting, writing, gardening, photography, scrap-booking, caring for animal habitats, cooking, styling, origami, musical instruments, woodwork, sewing, ceramics, crafting, dancing, doing puzzles, singing and so, so much more. Don’t worry about how it looks, what matters is how your feelings while you’re creating. Art is in the eye of the beholder and all that you have to do is look within you to behold the artist that you already are. Get out there and create. 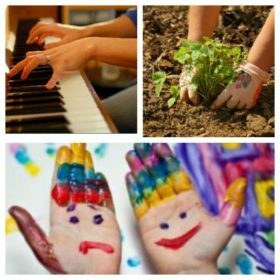 If you need additional excuses to create, come check out Sanctuary Counseling’s Expressive Arts Workshops!